Near and dear to my heart is my favourite charity, Samaritan’s Purse. I shared info on them in previous blogs. As the season of giving is upon us, won’t you please consider supporting their global efforts to love and support others as the hands and feet of Jesus Christ? Below is a story worth reading about one of the many doctors who come along side of Samaritan’s Purse efforts. Merry Christmas! World Medical Mission was established in 1977 to assist general surgeons who wanted to volunteer for short-term mission trips. Today, Samaritan’s Purse places volunteer Christian physicians, dentists, and other medical personnel in mission hospitals and clinics around the world. They also staff a biomedical department and warehouse that provides critically needed medical equipment and supplies to medical mission facilities. The life of a missionary doctor can be difficult at times, but this doctor in the Republic of Congo has learned how to count her blessings. Laura Foudy was born and raised in Huntington, Ind., in a family of four kids. She attended Spring Arbor University for a Bachelor of Arts in Biochemistry and completed medical school at Indiana University, followed by residency training in Family Medicine at Saint Joseph Regional Medical Center in South Bend, Ind. She is now working for Samaritan’s Purse in our two-year Post-Residency Program in Impfondo, Congo. I’m a poor missionary. I rely on others to provide for my financial well-being. I don’t own a car, and I don’t own a house. I don’t have a television or video games. If I want pizza, I make it from scratch. There is no carry out or home delivery. My idea of “fast food” is when the chicken lady has grilled chicken ready in the evenings in the market, and I get it “with mayo and onion, don’t chop it, and hold the hot peppers.” Having Coke and Pepsi is a special occasion. Butter, cheese, and real milk are specialty items. 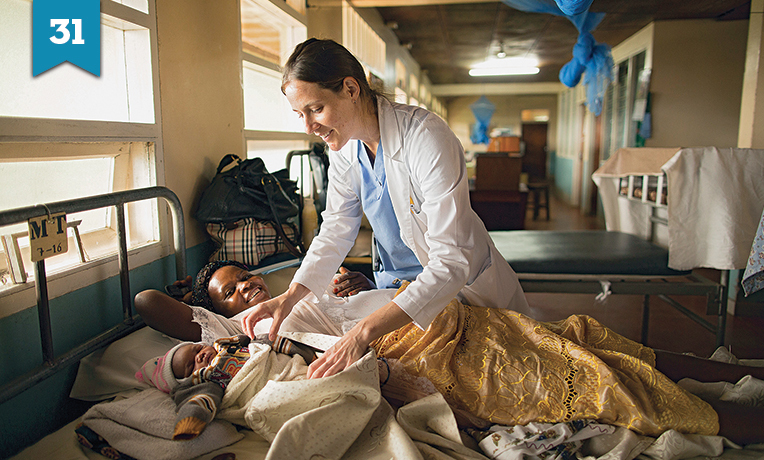 Dr. Foudy sees a variety of cases at her hospital in the Republic of Congo. Every time I take a shower, I only have cold water. The only time I wash my dishes in hot water is on a hot sunny day at noon, when the water in the pipe leading to the kitchen is hot. I make my own granola, yogurt, and bread. Chips and pretzels are a special treat. I have electricity when it’s sunny and I haven’t used up all the battery power in the 12V truck battery to charge other things during the day. I am a rich missionary. I live in a house made of bricks. All my windows have screens and glass panes. I have screen doors. I sleep in a bed with a real mattress, not just a piece of foam. I have running water in my house that is clean enough to drink. Give to Support a Missionary DoctorI have a solar panel and battery in my house, and I have functioning light fixtures in each room. I have a refrigerator that works and can afford to purchase kerosene to keep it running. I can purchase Coke, Fanta, and occasionally chips and cookies in town. I can afford to buy cheese and butter occasionally to have it brought up by a visitor. I own a bike, have a driver’s license, and have a truck available for my use. I have a high school diploma, a college education, and a professional career. I own a computer, two telephones, and an iPad, and I know how to use them. I can afford to have someone wash my clothes each week and clean my house twice a week. Sometimes it’s hard when people see your white skin and think, “Oh, she must have a lot of money,” when I am constantly thinking of how I’ll pay next month’s loan payments along with insurance payments, how I’ll have living money when I get back home, etc. By American standards, I’m quite poor. But by African standards, I’m filthy rich. I’m torn between two worlds. I don’t have money to help everyone here who needs it. Nor is it necessarily my responsibility to financially help everyone. Sometimes it’s what’s needed, and sometimes not. But at times when I am worried about how to pay next month’s bills, it’s good to remember all my blessings. I don’t worry about where my next meal will come from or that my clothes are all dirty and my kids might not have a dry place to sleep. Dr. Foudy’s main focus is family medicine. She treats everyone from newborns to the elderly. But it doesn’t stop me from being concerned for others who have those worries. My goal here is to help others help themselves. Sometimes their biggest problem isn’t material poverty, though that is what is easiest to see. Sometimes it is relational poverty, poverty of community, or spiritual poverty that causes more problems. For example, there is a woman here whose children have been treated several times for malnutrition. She is poor, but her children should have enough to eat. She has a tendency to use her money to buy clothes for herself rather than food for her children. So, giving her money is not what will help her best. Helping her become responsible for her children is better. But sometimes, knowing when to help and how to help can be quite difficult. It takes a bit of prayer, wisdom, and sometimes patience. So, next time you’re worried about money, about what you will eat and what you will wear, count your blessings. You don’t need to worry about such things, for our Father provides for the birds of the air and He will certainly provide for you, who are much more valuable than the birds. Support a New Missionary DoctorJesus told the story of a man who was attacked on the road to Jericho. A priest and a Levite saw the man yet crossed to the other side of the road. “But a certain Samaritan, as he journeyed, came where he was. And when he saw him, he had compassion. So he went to him and bandaged his wounds” (Luke 10:33-34, NKJV). Likewise, missionary doctors are treating the sick and wounded who might otherwise be abandoned without the medical care they need. Samaritan’s Purse gives young Post-Residency Program physicians the opportunity to serve two-year assignments that pave the way for missionary careers. Your gift of $4,200 can support a new Christian doctor and family for an entire month and bring medical care to thousands for about $7 per patient. Thousands have already experienced the joy of honoring their loved ones through our gift catalog. This Christmas, you can too. Give a gift in the name of someone special to show how much you care for your family, friends, and those around the world who need hope. Pick out your gifts. Go to the checkout. Select HONOR CARD, MEMORY CARD, or ECARD. We’ll send a personalized card or email announcing your gifts and describing their impact.